You are here: Home / Ethnic Groups / The People of Sulawesi / Who are the Dampelas? The Dampelas live in Central Sulawesi. Their area on the northwestern peninsula of Sulawesi is bounded by the straits of Makassar to the west. The word Dampelas originated from the words dampe and las. The word dampe means “seed” or “ancestry.” The word las is used as an abbreviation of the word Ihlas, which was the name of the first king who ruled in this area. Therefore, “Dampelas” means those who are descended from the line of King Ihlas. They believe that their forefathers were Tomanoru. These beings from heaven could incarnate themselves in certain plants and one of these incarnated plants became a man. The Dampelas language is similar to the language of Tomini. It is part of a larger language group called the Southern Tomini subgroup which also includes the Pendau, Taje and Tajio languages. Most of the land is mountainous and is used for agricultural purposes. However, in the interior areas, the forest is still virgin. The jungle is noted for its harvest of rattan, lumber and resin. The major commodities of the area that are exported to other islands are: copra, cloves, rattan and resin. Traditional handicrafts include woven silk and crafts made from cloves exclusive to the Toli-Toli. The Dampelas make their living primarily as hunters, farmers and craftsmen. As a result of their farming methods, they are frequently forced to move as they do not use methods that keep the soil fertile. When the land begins to produce a poor crop they move to a more fertile area. The Dampelas have been Muslim for generations. Many of them are proud of their Islamic identity and devoutly seek to follow the five pillars of Islamic practice. However, many of them still hold to traditional animistic beliefs, such as beliefs in powerful spirits and sacred places. They believe these sacred places give them protection. The Dampelas also go to them to ask for special blessings in accordance with following certain customs. One of the Dampelas traditions is the mogupa ceremony. This ceremony is a blend of cultural and Islamic elements. It is performed as a means of honoring those who have died. Moguto buwiyan is a ceremony to exorcise epidemics or serious illness. 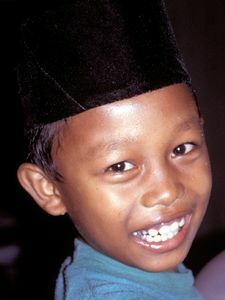 Other life cycle ceremonies include the monilam (circumcision) and malead (the teenagers’ teeth are filed as a sign of becoming adults). At this time, medical help is needed, as the standard of healthcare in the area is poor. The Dampelas also need technical assistance and training to increase the yield of their harvests. This would increase their standard of living, which remains relatively low.